Two people have been arrested in connection with a disorder during Celtic's home tie against Hibernian. Eyewitnesses said trouble flared in the Celtic stands at Celtic Park shortly before the end of the game, which finished goalless and left the Hoops 12 points behind Scottish Premier League leaders Rangers. 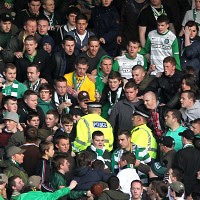 The match also saw more protests against the Scottish Government's Offensive Behaviour at Football and Threatening Communications (Scotland) Bill, designed to "eradicate" sectarianism from Scottish football. Celtic fans waved banners reading "Fans Against Criminalisation" and "Kill The Bill". The trouble was said to have started around ten minutes before the end of the game in the "Green Brigade" section of the stands. One eyewitness said: "The police started to lift people. Some of the fans started running along the stands, and there was something going on underneath the stands too." Football fans were also talking about the incident and posting photographs on internet forums and social media websites. Writing on the online forum ScottishFitba.net under the headline "Green Brigade skelped by Strathclyde's finest", user Red777 said: "After a crowd disturbance at the end of today's 0-0 at Parkhead...the Green Brigade decided to leave the ground as one, shadowed by the polis (police). "More trouble ensued within the stairs/concourse area and the GB were held within the stadium while the police made arrests." Writing on the fans' forum Kerrydale Street, user Celt88 said: "Police were really heavy handed with the Green Brigade after the game. Wouldn't let them leave and they had to move along to the Jock Stein end to get out. From what I saw the Green Brigade done well not to react as it really looked like it was going to kick off as the police waded into them trying to make arrests." A Strathclyde Police spokesman confirmed that two people have been arrested in connection with a disturbance in the ground. Saturday's match is the second meeting between the two clubs in four days, following Wednesday's Communities League Cup quarter-final which also saw disorder amongst fans. Police said Celtic and Hibs fans were involved in "pre-organised football related violence" after the match, which Celtic won 4-1.